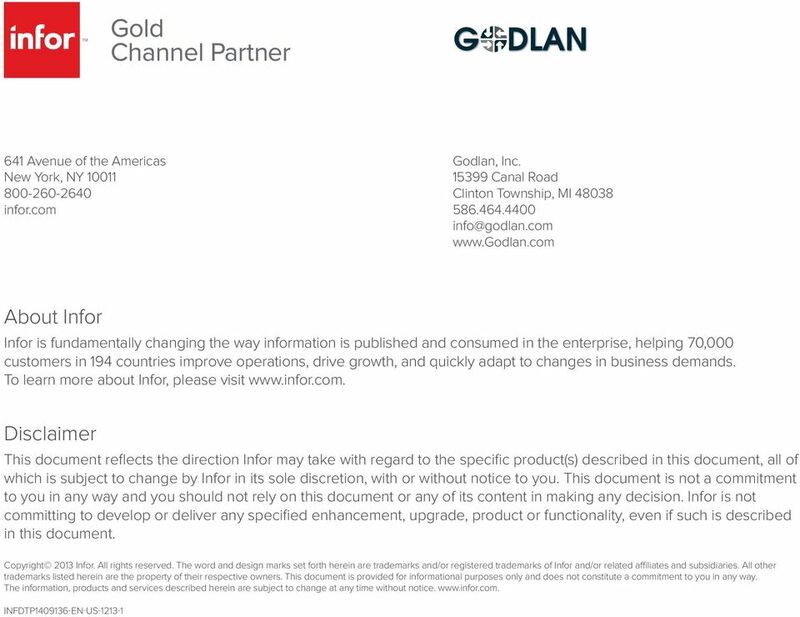 Download "Executive summary. Table of contents. Four options, one right decision. 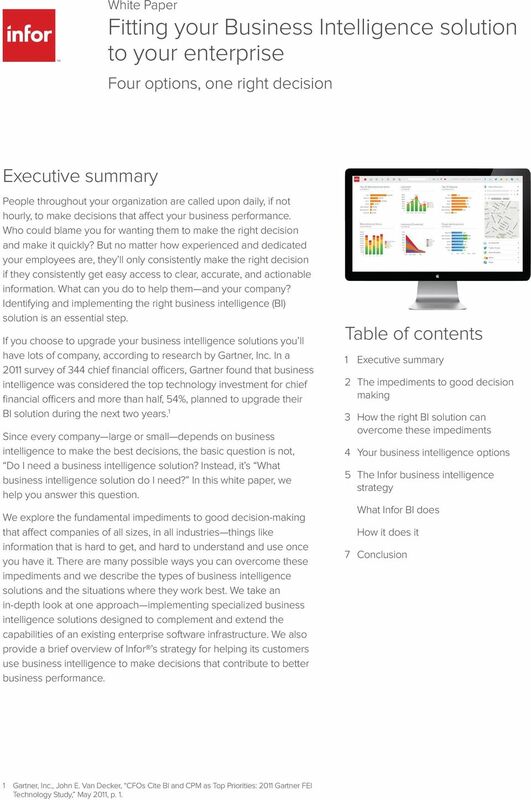 White Paper Fitting your Business Intelligence solution to your enterprise"
1 White Paper Fitting your Business Intelligence solution to your enterprise Four options, one right decision Executive summary People throughout your organization are called upon daily, if not hourly, to make decisions that affect your business performance. Who could blame you for wanting them to make the right decision and make it quickly? But no matter how experienced and dedicated your employees are, they ll only consistently make the right decision if they consistently get easy access to clear, accurate, and actionable information. What can you do to help them and your company? 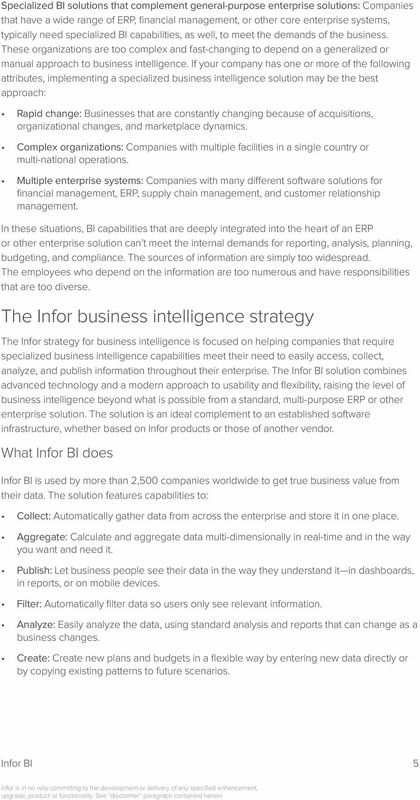 Identifying and implementing the right business intelligence (BI) solution is an essential step. If you choose to upgrade your business intelligence solutions you ll have lots of company, according to research by Gartner, Inc. 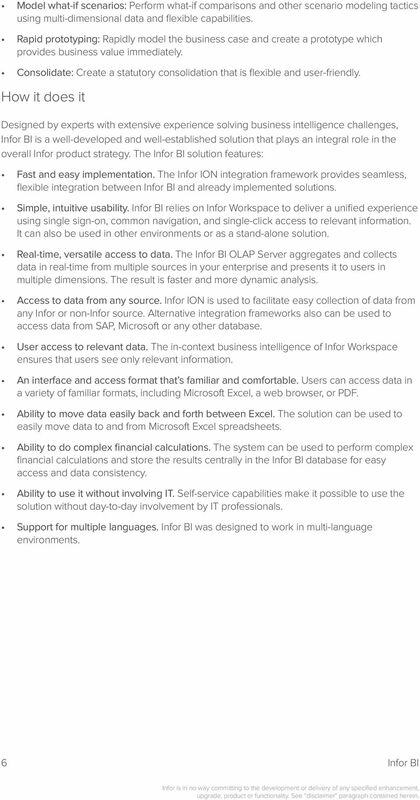 In a 2011 survey of 344 chief financial officers, Gartner found that business intelligence was considered the top technology investment for chief financial officers and more than half, 54%, planned to upgrade their BI solution during the next two years. 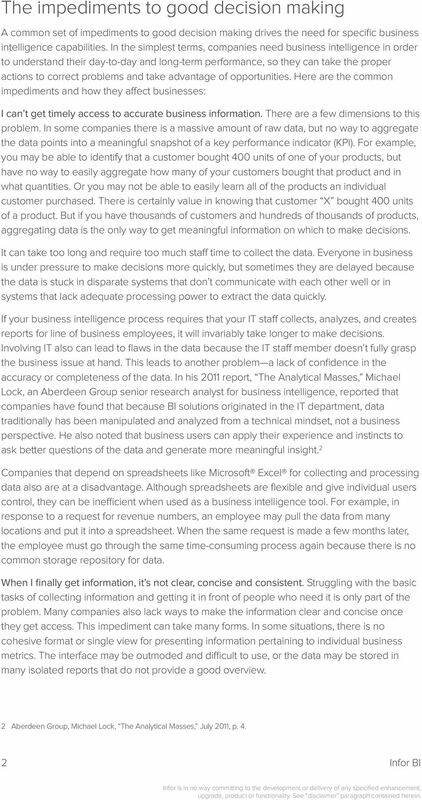 1 Since every company large or small depends on business intelligence to make the best decisions, the basic question is not, Do I need a business intelligence solution? 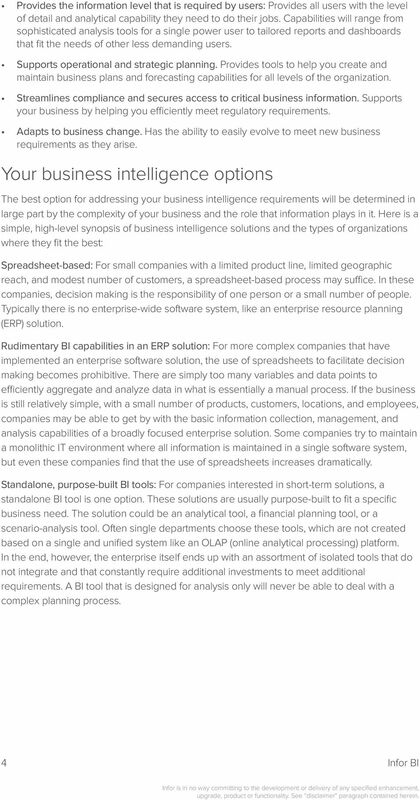 Instead, it s What business intelligence solution do I need? In this white paper, we help you answer this question. We explore the fundamental impediments to good decision-making that affect companies of all sizes, in all industries things like information that is hard to get, and hard to understand and use once you have it. 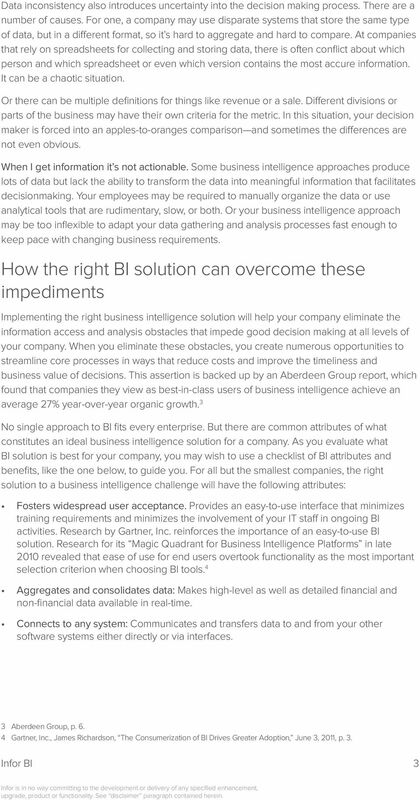 There are many possible ways you can overcome these impediments and we describe the types of business intelligence solutions and the situations where they work best. We take an in-depth look at one approach implementing specialized business intelligence solutions designed to complement and extend the capabilities of an existing enterprise software infrastructure. 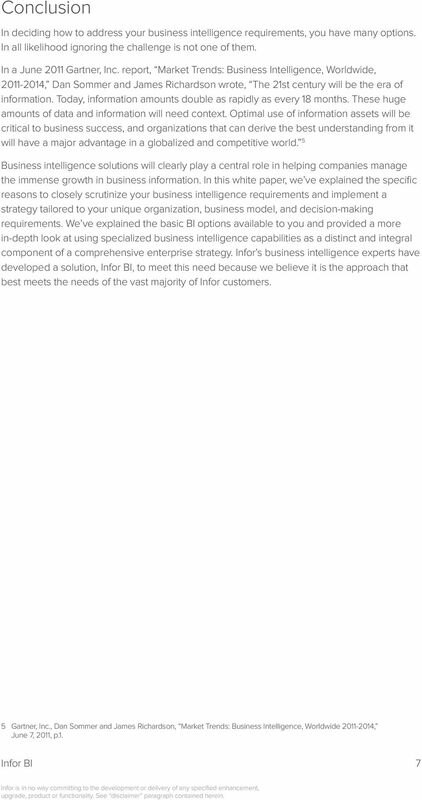 We also provide a brief overview of Infor s strategy for helping its customers use business intelligence to make decisions that contribute to better business performance. Table of contents 1 Executive summary 2 The impediments to good decision making 3 How the right BI solution can overcome these impediments 4 Your business intelligence options 5 The Infor business intelligence strategy What Infor BI does How it does it 7 Conclusion 1 Gartner, Inc., John E. Van Decker, CFOs Cite BI and CPM as Top Priorities: 2011 Gartner FEI Technology Study, May 2011, p. 1. The Connected CFO a company s secret silver bullet?